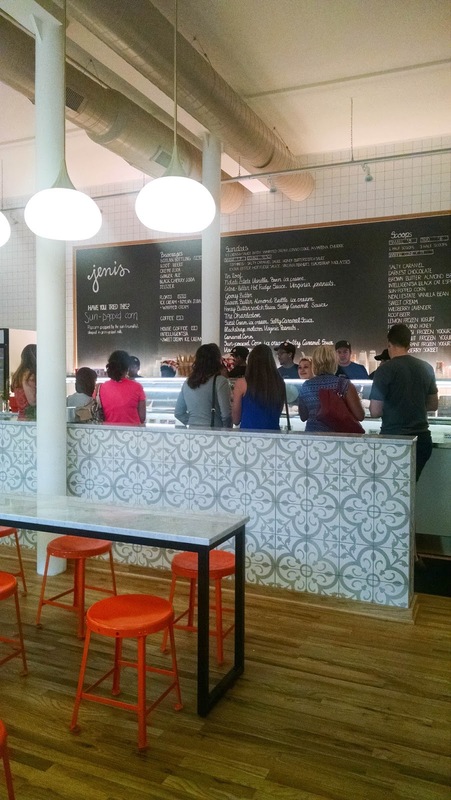 I had sworn off ice cream for the year and kept pretty good on my promise until I was invited to a sneak peek of the new Jeni's ice cream shop that opened about a mile away from us. So, I loaded up on my lactaid and headed over. I got to meet Jeni and it was amazing! Besides Jeni's, I always take visiting family to Ices Plain & Fancy where they make liquid nitrogen ice cream to order. Their s'mores flavor is to die for. With all these great choices, I've been feeling inspired to try out some fun stuff at home, too. I know most of you don't typically just have macarons lying around your house like I do. Since I make them for a living and still occasionally screw them up, there's always plenty to gift to friends, send to work with Joe, or serve as a snack when someone stops by. But I never thought of swirling them into ice cream until recently. Joe would occasionally eat ice cream with a crushed macaron on top, which added a lovely crunch to it. I even made cute mini little macaron "toppers" a long while back that went perfectly with ice cream. But what about macarons frozen into the ice cream? The macarons get chewy yet still have a light meringue bite. 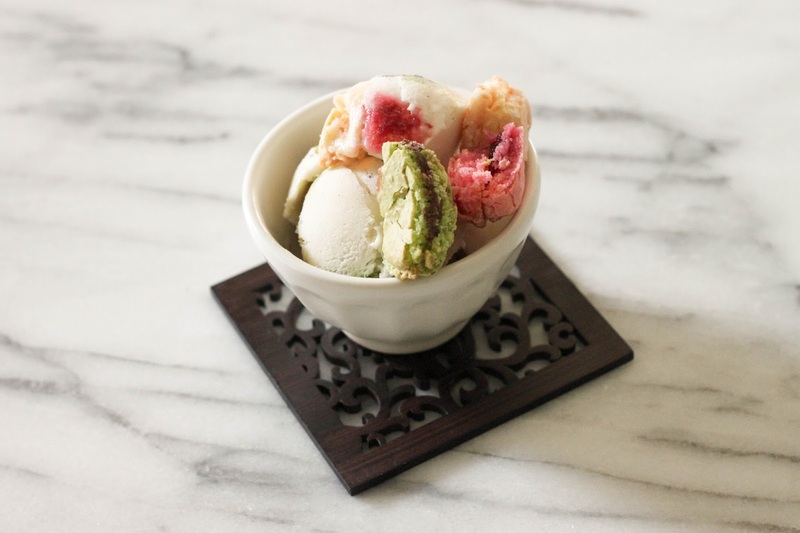 Better yet, what about different flavored macarons swirled into one ice cream?! I swirled raspberry macarons, pistachio nutella macarons, and some lemon macarons into vanilla ice cream and the results were fantastic. 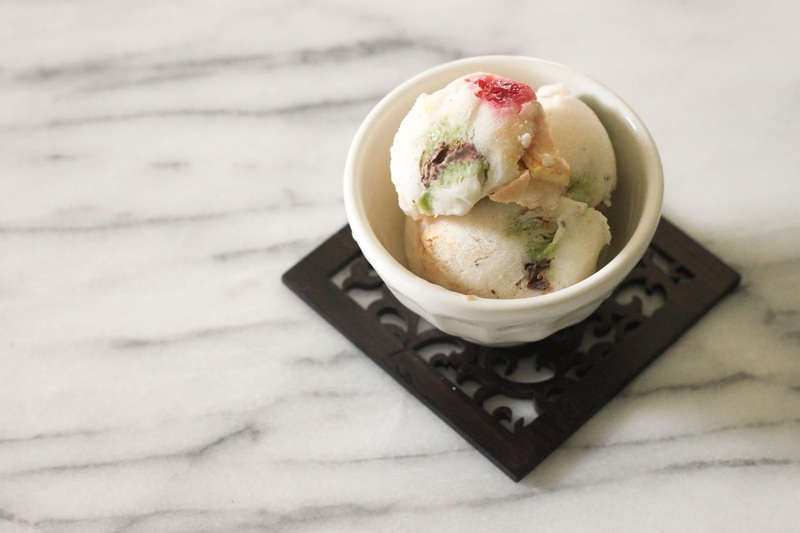 We couldn't stop sneaking bites of it and it's fun to have such contrasting flavors, but of course feel free to use just one kind and into any kind of ice cream. I've always been a fan of vanilla ice cream with chocolate or other flavors swirled in, as opposed to chocolate ice cream. If you don't want to go to the trouble of making macarons, I've seen them now at Trader Joe's and Sam's Club. Even though they're frozen, they're pretty tasty! And if you're in St Louis, I can certainly deliver a batch in whatever flavors you like. I love making Jeni's vanilla bean ice cream base--it has no eggs which saves me the trouble and anxiety of cooking with egg yolks yet still comes out so creamy and delicious. Use your fancy vanilla beans if you have 'em! Make the shells: Place the egg whites and sugar into a bowl. 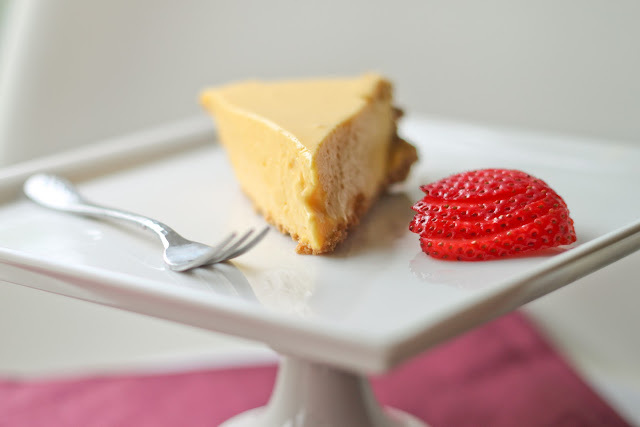 Using a hand or stand mixer, beat on high until stiff. You can check the stiffness by turning the bowl in all directions. It shouldn’t move. Sift the powdered sugar and both of the flours into the bowl. Using a spatula, gently fold the ingredients into the mixture. You want to get the air out of the mixture, and you want the batter to become flat and slightly/slowly spread when you stop mixing. Make sure to dig to the bottom of the bowl to remove any white streaks. Once combined, pour the batter into a piping bag with a round tip. 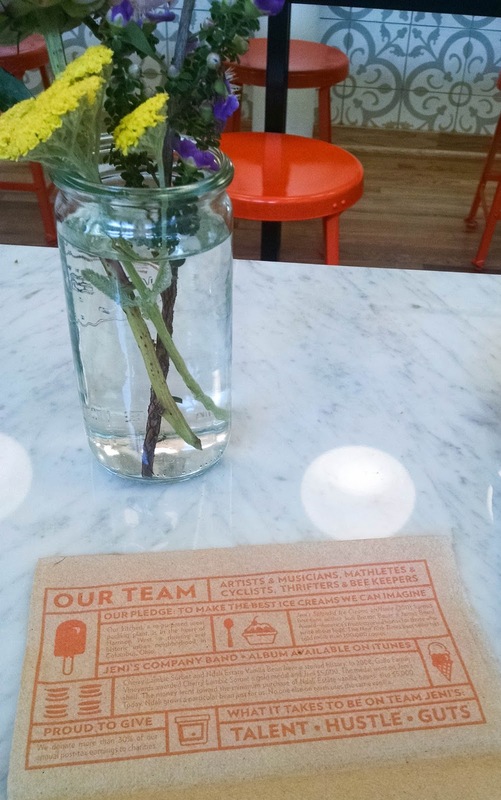 Spread out a silpat mat or parchment paper and hold the bag perpendicular to the sheet, piping small rounds and leaving space in between for them to spread. Once you've piping all the macarons, tap the sheet on the kitchen counter to get any air bubbles out. Let dry completely for about 30 minutes to several hours (the tops will be dry to the touch). Bake the sheets one at a time in the middle rack for about 16 minutes, rotating halfway to make sure they bake evenly. Let them cool completely before trying to pick them up off the sheets. It might be easier to hold the sheet up and gently peel the sheet off from the macarons. Pair them together and sandwich with raspberry jam or Nutella. Feel free to use the recipes for the fillings from above and omit the Earl Grey and the Bourbon--the base is infinitely adaptable. Let the macarons "set" by sandwiching them and then freezing for about 12 hours. This lets the filling meld with the shells and they taste much better than if you eat them right away. Remove and once they are softened a little, chop into quarters and churn into the ice cream while the ice cream is still soft. 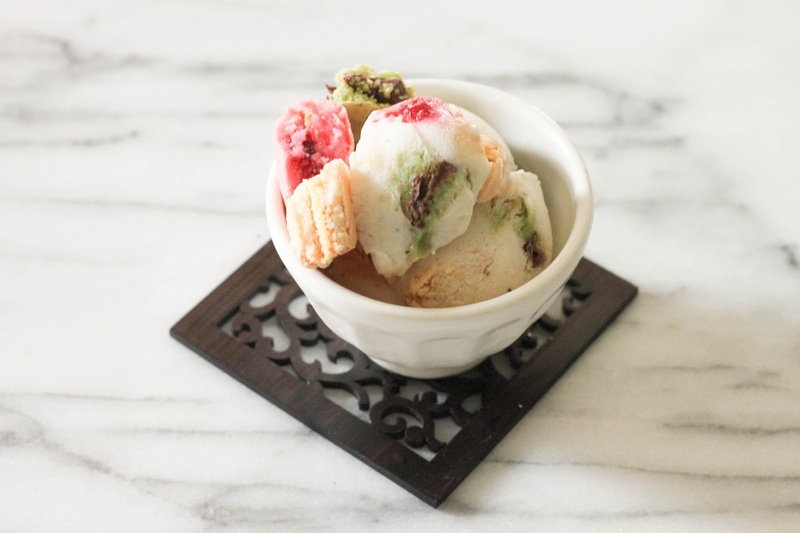 Save some pieces to serve on top of the ice cream. Melt the cream cheese and salt together in a medium bowl and set aside. Lower the heat and whisk in the cornstarch slurry, and then turn to medium-high heat again, whisking all the while. Gradually whisk the hot milk mixture into the cream cheese and salt until smooth (it's ok if it looks a little lumpy). Cover the bowl with a lid or plastic wrap and let it come to room temperature. Then store in the fridge until chilled thoroughly. In the last few minutes of churning, you can drop in the macaron pieces, or you can wait till it's done and swirl it into the the container. Pour into a container and freeze for at least 2 hours before eating. it still kills me that we were both at the Jeni's pre-opening night and TOTALLY missed each other. WHYYYYY?! and i've heard very good things about Ices P+F's s'mores flavor: once i get back from vacation i'm making a trip. I KNOW. I hope we are destined to meet in person at some point soon! And yes. You have to try the s'mores there!